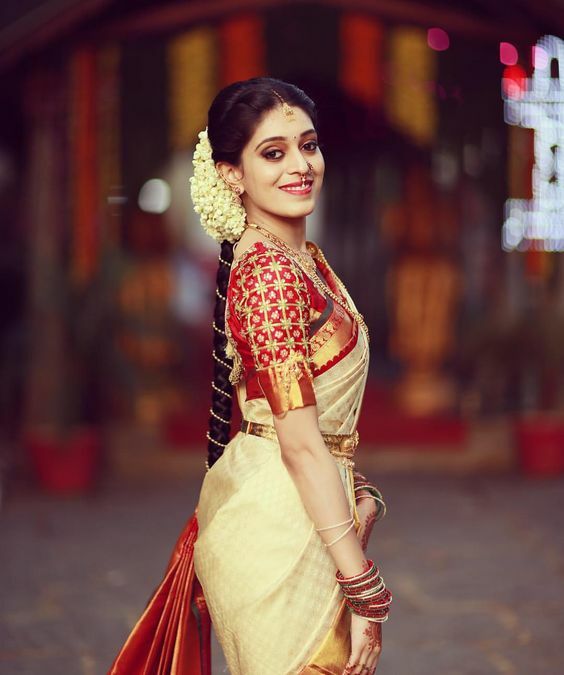 Saree which symbolises the traditions and cultures of India is a pivotal part of a woman’s wardrobe. Just like tasty icing completes a cake, a beautiful and matching blouse design completes a saree with style. With the evolution of new fashion trends, new blouse designs have also been surfacing. 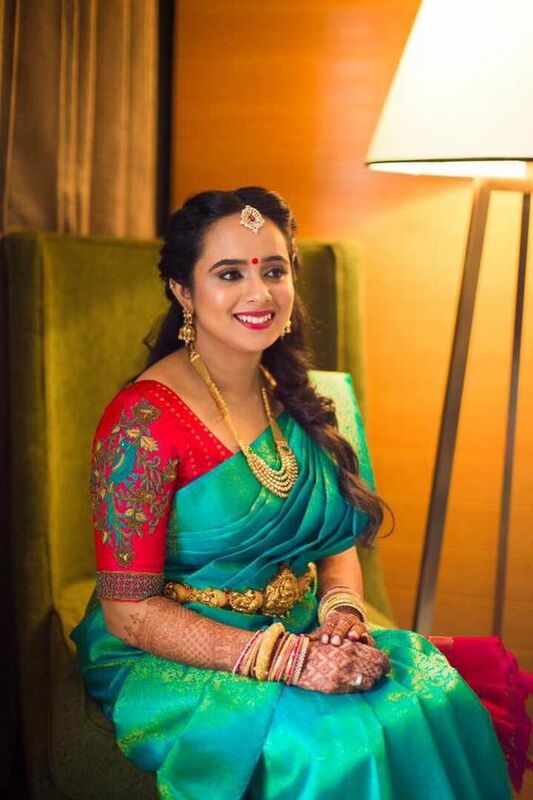 The material and design of your blouse should depend on the colour and texture of your saree. 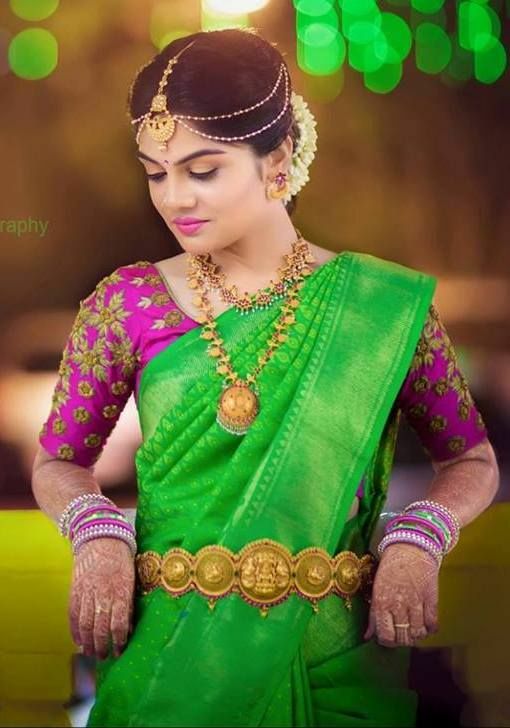 Normal sarees are different and pattu sarees are different. 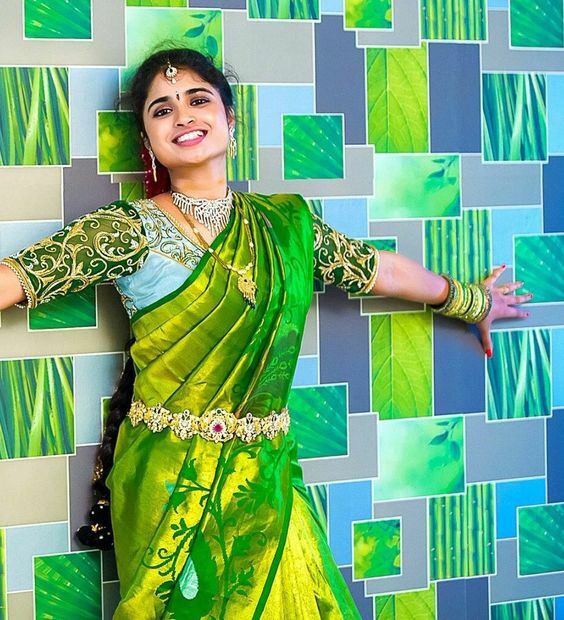 When it comes to classic traditional wear, pattu sarees crosses the minds of everyone. 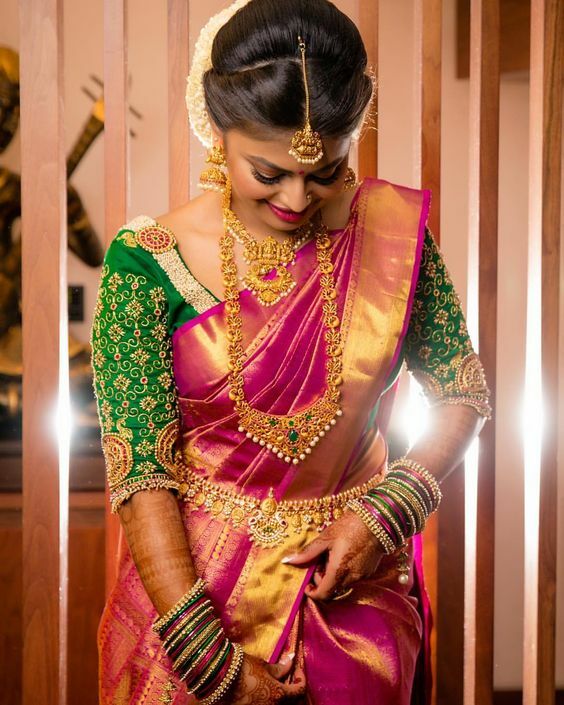 A gorgeous blouse enhances the beauty and gorgeousness of a pattu saree. 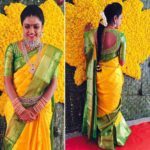 Wearing a mismatched blouse with a lovely pattu saree, will ruin not only the saree’s beauty but your overall appearance, as well. 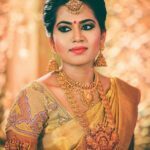 It is essential to get every detail of the blouse right, starting from the fabric, colour, texture, neck design, back design, embroidery, etc, so that the blouse effortlessly blends with the saree. 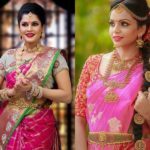 Before we show you a list of fabulous blouse designs for pattu sarees, let us give you some important pointers about blouse designs. This blouse may look simple with no embroidery but it combination of 2 types of sleeves is the major attraction of the blouse. This bottle green blouse with a deep boat neck has 3/4th sleeves which is a combination of puff sleeves and golden greenish patch sleeves. The golden patch sleeves are has elevated this blouse style a lot more. This blouse is best suitable for dark coloured sarees with golden embroidery. Cold shoulder dresses are the top grossing fashion trend of 2018. 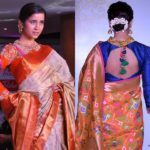 So why not wear an urbane cold shoulder blouse with a pattu saree? This style will be a perfect blend between traditional and modern trends. The golden bead works on the neck and sleeves and the small golden embellishments on the blouse add chicness to this blouse. The blouse is best suitable for subtle shades like beige, ivory, off-white etc. 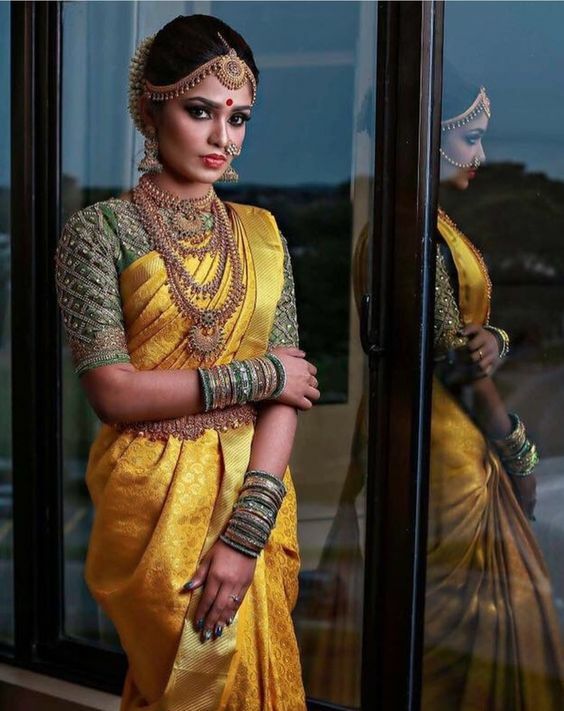 A richly embroidered blouse is the perfect choice for a pattu saree. 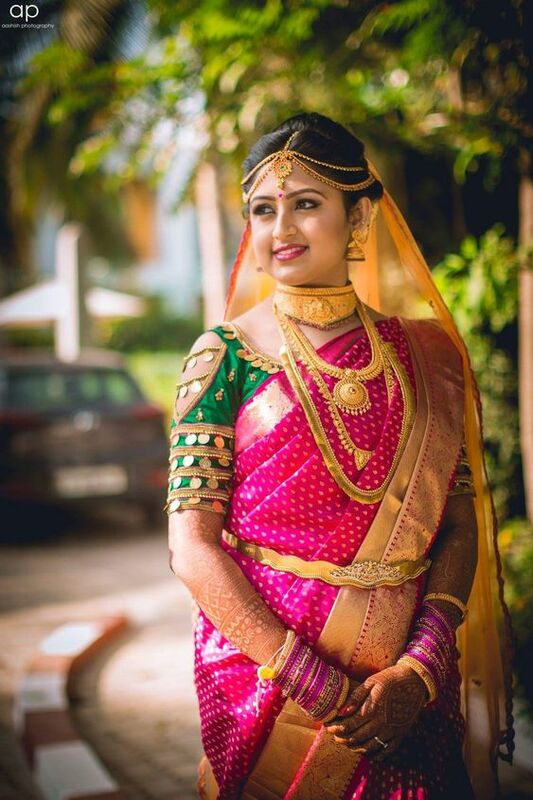 As pattu sarees are gorgeous attires, a heavily embroidered blouse, will do full justice to its grandeur. This parrot green blouse with open neck design will sway everyone away, with its minute embroidery work. The golden embroidery on the sleeves and neck with tiny stitching is a sight to see. This blouse is an exquisite work of art and is a must have bridal collection. The red blouse has golden pattern and embroidery work on its sleeves and body. The golden patch at the end of the sleeves is the show stealer. This is best suitable for brides to wear at their wedding ceremonies. 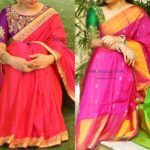 Magenta blouses are best suitable for deep or dark green pattu sarees. This blouse although simple will stun everyone with its vintage appeal. 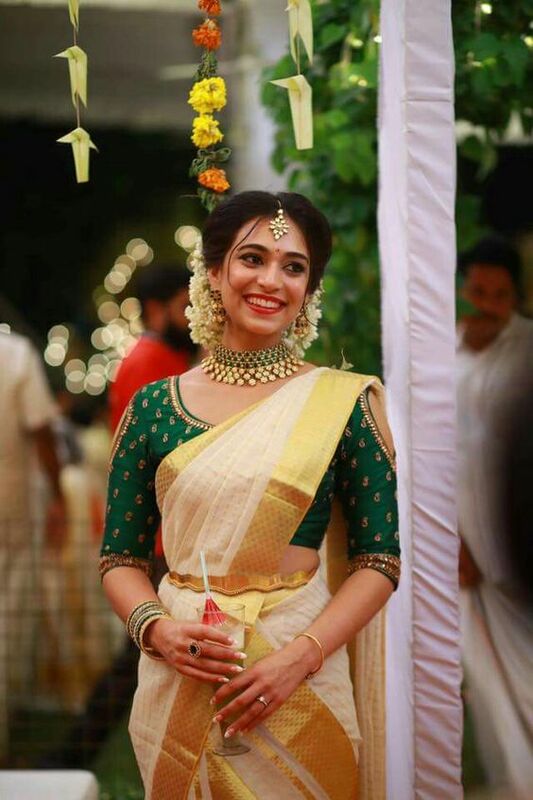 The body of the blouse is plain but the golden patch design and pearl work with emeralds at the hem of the sleeves, is what adds a classic touch to the blouse. The golden beads work on the neck of the blouse classily finishes the look. 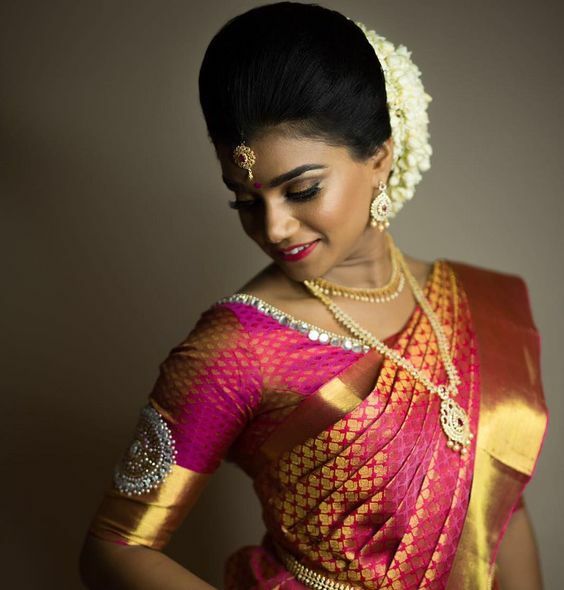 The saree is a piece of art with pink and golden brown patterns all over its body. The mirror work on the neck, pearl work in the shape of a wheel and golden patch at the hem of the sleeve add ethnicity to the blouse. This blouse design is best suitable for sarees having pink, gold or golden brown undertones. Are you a fan of glittery golden thread work? Then this pretty bubble-gum pink saree with shiny, glittery golden embroidery on its neck and cuff is the perfect blouse for you. The tiny golden dots on the body of the blouse add to its extravagance. 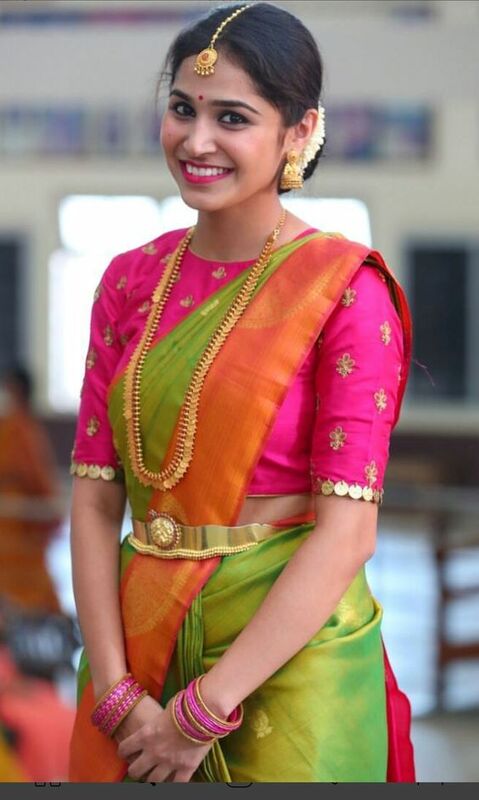 Want a traditional blouse? 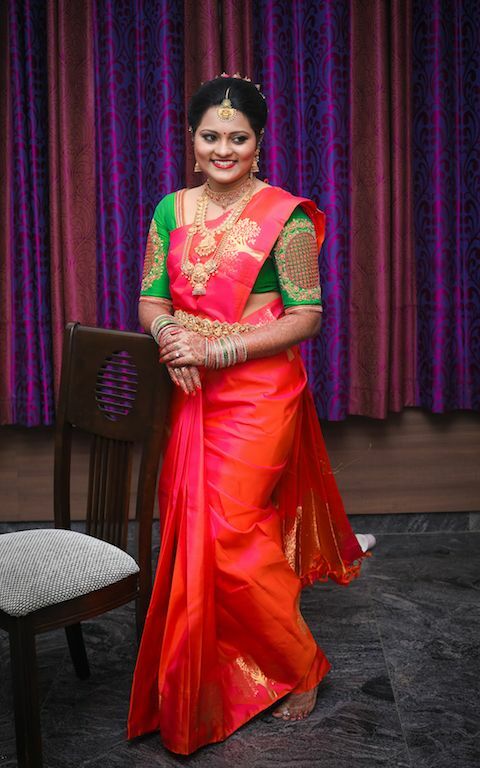 Then this red blouse with peacock embroidered on the sleeves in multi-coloured thread work is a perfect choice for any shade of green pattu sarees. The blouse has deep neck and 3/4th sleeves covered with red and green flower embroidery. The neck of the blouse has thin border layers of red and green. 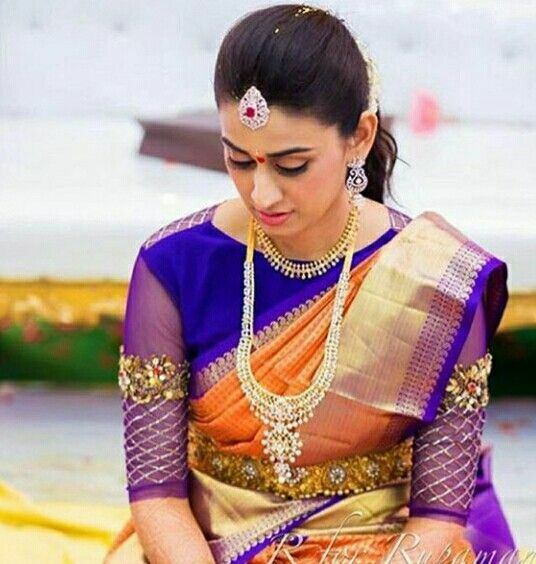 The blouse is best suitable for bright coloured pattu sarees. This blouse is a masterpiece in itself, due to its unusual colour combination. The richly designed blouse with sky blue body and green sleeves packed with golden embroidery reflects royalty and is a great piece for any bride. This antique blouse design is filled with beautiful silver work all over it. The high neck blouse has hints of olive green colour emitting from its heavy silver work. Want some queen like feeling? Well, this blouse comes to your rescue. We understand that some women are not comfortable with cold-shoulder blouses. So this amazing cold-shoulder green blouse design with golden mirror work all over its body and also covering the open shoulder space, to your rescue. This beautiful kassu work is a combination of navy blue and purple colour. The purple colour embraces the body, whereas purple net fills the 3/4th sleeves and back of the blouse. The golden flower stitching and silver thread work add glamour to the blouse. This simple blouse is best suitable for lunch parties or get-togethers. The deep pink blouse has petite golden embroidery on its body, and the golden mirrors hanging from the cuffs are show stealers. This blouse design is the epitome of simplicity. The austere bottle green blouse has a round neck and highlighted sleeves. The cuffs of the blouse are filled with golden beads, thus enhancing its minimalism. This blouse design can be best worn with white, ivory or beige coloured pattu sarees. 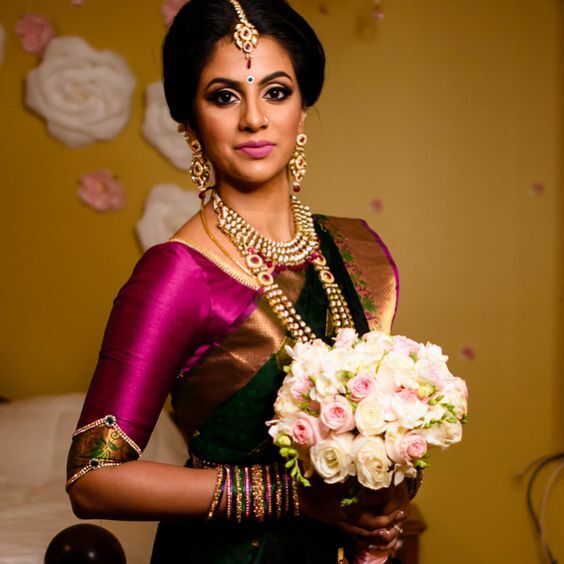 Want a glamorous blouse for your plain pattu saree? Then this heftily embroidered blouse is perfect for you. The blouse has a pink body, with golden and pink patch work on the cuff. Apart from heavily embroidered golden and white mirror work, the blouse also has thin layers of purple borders. 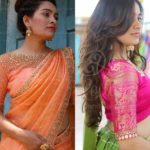 According to fashion experts, no matter how gorgeous or dazzling a saree is, an incompatible blouse can ruin its look completely. So choose your blouse design wisely. 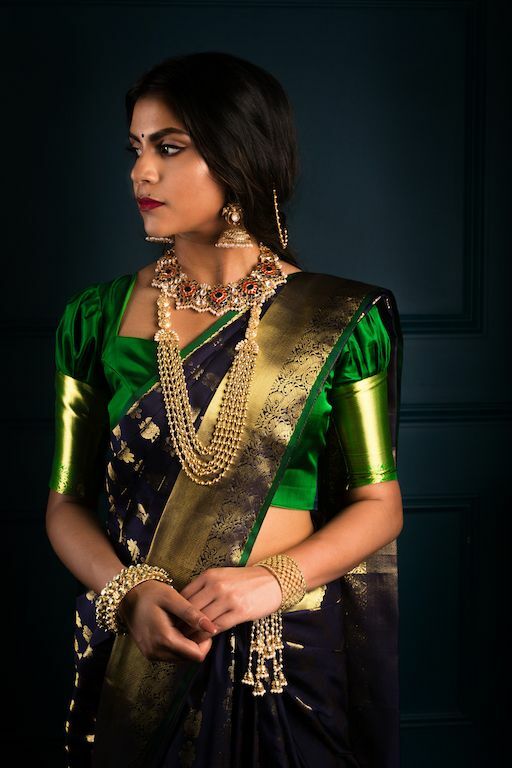 It will dramatically elevate your saree style.